"Konichiwa. I am Dolores, an orbital frame." Zone of the Enders: Dolores continues the series of side-stories based on the Z.O.E. video game, started in Idola. It is not a direct continuation, however, but rather set in the same universe in a different time, preceding the events of the major war between Mars and Earth to come. Dolores takes a slightly new direction from Idola: telling a longer, more linear story. The sci-fi and action elements are all there, enhanced by a deeper story about a family caught up in the rage between Earth and Mars purely by chance. It is also not quite as serious and grim as Idola, taking on a more lighthearted tone of spirited adventure as opposed to the intense emotional conflicts previously seen. The story begins with cargo ship operator James Links hazily getting himself through another drunken day of boring shipping work. Living on an orbital station between Earth and Mars, he experiences the tensions between the two planets personally, though it doesn't effect him much. After the death of his wife, his two children on Earth have grown apart from him and have no desire to get back in touch with him. James decides to change his destiny by accepting a high-paying, risky mission, and then buys some books on parenting. At 49, he wants to become a real father, even though his two children are full grown. He sets off to complete his mission and head to Earth, but along the way he runs into a strange assassin that tries to kill him and take his cargo. What is he carrying? As it turns out, a giant robot known as an Orbital Frame (the new kind of Martian weapon introduced in Idola). She politely introduces herself as "Dolores", and seems to have the attitude and mind of a little girl. Rightfully confused, James forges a strange friendship with this ultra-powerful machine of destruction that behaves like a child. Wrongfully accused of killing space policemen, James finds himself captured by Earth security by a smart-mouthed captain who mockingly refers to James as "John Carter" (a reference to the Edgar Rice Burroughs novels). Dolores rescues him, helps him find his kids (who are not at all happy to be reunited with their father), and finds herself fascinated with the world in general, much the child she is meant to represent. Awkwardly, James must unite his family to not only prove their innocence of any crime, but figure out just what Dolores is and what her mysterious connection to James' wife is. Could she still be alive? Only on Mars will the answers start to emerge. If it is not already obvious, this is not the typical "lone-hero-who-looks-cool-takes-on-everyone-in-a-giant-robot" anime. Instead, it's a funny, charming, and often bittersweet look at a dysfunctional family trying to put aside their past differences in order to potentially find a whole new part of their lives. The sci-fi and action elements are handled well, but they take a backseat to the drama, which is focused on the subtle issues of Earth's incredibly tight control over its own people, mixed with the hatred of Martian colonists. I dare say this has resulted in potentially one of the best anime series to come out in recent days. It's exciting, but the story also has great depth. Even more interesting is the fact that James wants to avoid killing and destruction, so while there is violence in the show, it is minimized a great deal as he tries to teach Dolores not to over-use her incredible powers. It's unique to have a series like this where the most potent and dominant character (Dolores) is just a baby, really. It adds a whole new kind of aspect to the usual mechanics of a giant-robot-based show. Z.O.E. : Dolores has gone way beyond its video game roots and the previous Idola incarnation. It's now become a strong dramatic show that allows a single family to become more important than the whole space-war subject, which is a clever and fresh idea. Image Transfer Review: It's another ADV, cel-perfect transfer here. While the animation isn't quite as detailed or heavily animated as some of its brethren, it does seem primarily based on hand-drawn work as opposed to the super-perfect computer animation that has become so common. There are no artifacts or any kind of source flaws at all. While some dot-crawl and color-mixing occurs at some points, this is probably due to the sharpness of the transfer and its effect on certain displays and such. Audio Transfer Review: The Dolby 2.0 Surround audio is quite dynamic and effective, but never gets too wild or active. While subdued, it still delivers just enough of a punch to underscore action sequences and other exciting bits. While the English dub seemed to lack the cleverness of the Japanese, it sounds just as good, and both tracks deliver where it counts. While I didn't particularly like the new theme song for the show, that particular intro is arguably the most loud and active part of the average episode. Extras Review: The most interesting feature on the disc is a 10-minute or so look at the Japanese dubbing of the show. Typically, any extras on Region 1 DVDs dealing with dubbing almost always focus on the English voice cast, which I've always thought is a tremendous insult to your basic anime fan. For once, we actually get to see the Japanese actors doing their thing for a live ADR session. The footage they're dubbing is from an episode not on this disc (probably the next one), but it's still a lot of fun and shows how the process is performed. Unlike typical Western voicework, there seems to be a focus on live interaction between the cast, as opposed to separately recording their roles. Additionally, there are clean opening and closing tracks, galleries of artwork and basic design, and the usual batch of ADV previews. The disc is well designed and easy to get around in. Don't worry about the language option to select "Japanese with Song Subtitles"; there's normal English subtitles on that track, too. 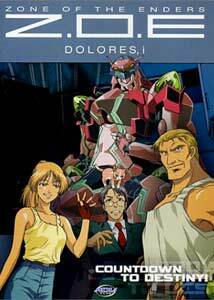 Dolores is a different approach to the Zone of the Enders world, and tells a more interesting story about people than anything else. Its strong characters and odd pacing make it an interesting change from the predictable pace of most anime in this vein. I look forward to the next volume of this curiously skewed sci-fi tale.